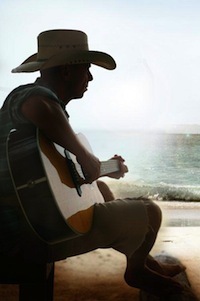 Kenny Chesney will release his next album April 30 on Blue Chair/Columbia Nashville Records. The as-yet-untitled project will be the follow up to 2012’s Welcome To The Fishbowl. Released June 19, that project was his 13th studio album and has yielded hits “El Cerrito Place,” “Come Over,” and “Feel Like A Rock Star,” featuring Tim McGraw. After 30 weeks on the charts, the album has sold over 605,000 copies. Chesney will kick off his No Shoes Nation Tour on March 16 in Tampa, Fla.
His career has resulted in 24 No. 1 singles and more than 30 million in album sales.